Growing up in a Lebanese family, I was surrounded by people who loved to prepare and eat good food. My mother, grandmothers, several great-aunts and even my great-grandmother all lived with us at various stages, and my earliest memories are of being chivvied out of the kitchen by female hands. It was always done with a smile, and with a piece of Arabic bread or stuffed vine leaf being stuffed into my hands. As I got a bit older, they started letting me watch them cooking, and eventually I was allowed to help. I have vivid memories of watching my great-grandmother pounding spices in a mortar and pestle, or my aunt washing mounds of herbs, or my mother pulling trays of kibbeh out of the oven. My father always wanted me to join the family business, but at the age of 16 I ran away from to home to start my cooking career by taking a job as a dish washer in a Mexican restaurant. After 8 months I was completely absorbed by the kitchen world and I started a formal apprenticeship in Melbourne. I spent 3 years working in a fine-dining, European-style restaurant before heading overseas to broaden my experience. I worked in France, Belgium, Italy, Austria and then Hong Kong. Health issues brought me back to Australia in 1989, and in 1991 I began the restaurant at O’Connells Hotel. This was where I began to build my reputation for innovative contemporary Middle Eastern food. In 2001, I set up the kitchen at MoMo restaurant in the heart of the Melbourne central business district, and I have been there ever since. In 2008 the restaurant re-located to the Grand Hyatt hotel. 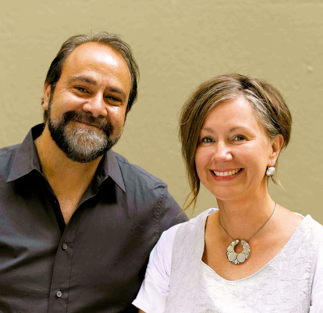 Greg Malouf is an Australian chef of Lebanese parents, also the executive chef at Melbourne’s MoMo Restaurant specialising in modern Middle Eastern and Eastern Mediterranean food. Jointly with his writing partner Lucy, Greg is the author of four cookbooks: “Arabesque: Modern Middle Eastern Food” (1999), “Moorish: Flavours from Mecca to Marrakech” (2001), “Saha: A Chef’s Journey through Lebanon and Syria” (2005) and last but not least, “Turquoise: A Chef’s Journey through Turkey” (2007). Another book, “Saraban: A Chef’s Journey through Persia” will be launched in November 2010. 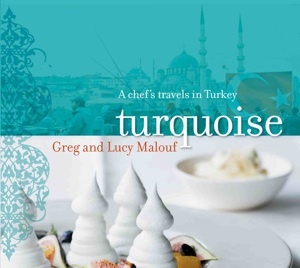 Greg and Lucy’s fourth book Turquoise, a travel-cookbook book on Turkish cuisine, won the “Best International Book” award by IACP (International Association of Culinary Professionals) in 2008. Below, you will meet this master, learn his thoughts and stories about Turkish cuisine and how he made Middle Eastern cooking his life’s passion. Chef Malouf will also be sharing a few of his favorite recipes on Foods of TurkeyTM in the following weeks. When researching different aspects of our cuisine for your book, did anything surprise you? Turkey – and Turkish food – was one surprising delight after another! I was bowled over by the differences, as well as the similarities. I don’t think Turkish food has a very clear identity or particularly strong reputation in the West, partly because tourists to the country tend to eat a limited repertoire of dishes at ‘traditional’ tourist restaurants. In the West, most Turkish restaurants are kebab restaurants or take-aways. I was most interested to discover the breadth and variety of Turkish cuisine. We tasted dishes in rural parts of the country that people in Istanbul had never even heard of. I was really excited to discover that as well as sophisticated and better known ‘Ottoman dishes, there are also a vast number of Anatolian dishes from country areas. I was also really surprised by some of the ingredients that are widely used in Turkish cooking. I had no idea that dill was such a popular herb, or that there were so many different wild greens used, or of the range of different kinds of dried red peppers. I was also blown away by the seafood cooking I enjoyed in Turkey. I guess it’s because of the long coastline, but I believe Turks cook fish and seafood better than any other country in the region. What do you find to be the most popular features of Middle Eastern or Turkish cuisine and dishes in Melbourne for an Australian audience? Australian diners are similar to other diners in the West - be it New Zealand, England or North America. They are all drawn to the exotic aura of the food, and in particular to the spices...to the layers of perfume, flavours and the textures of Middle Eastern dishes, which are so different to the European tradition. The idea of ‘mezze’ - or shared plates, is also something that appeals. I think diners also recognize the simplicity at the heart of many Middle Eastern and Turkish dishes. In Turkish food, in particular, the focus is entirely on the quality of the ingredients. There is virtually no saucing (as in French or Italian cuisines), which allows the intrinsic flavours of the meat/poultry/seafood/vegetables to shine through, unadulterated. How did you start writing about cuisines and travel and what inspired Turquoise and your most recent book? In 1998 I was commissioned to write, with my first wife, Lucy, a book about my food. We wanted to write a book that introduced the Australian reader and diner to Middle Eastern ingredients, and to my food, which at the time, was unique. Arabesque was published in 1999, (re-published 4 times since) and has been described as a best-selling modern ‘classic’, as an A–Z of ingredients that define Middle Eastern cooking and a collection of traditional and modern Middle Eastern dishes. Arabesque was followed by our second book, Moorish, which expanded the scope of dishes into North Africa and Southern Spain. In 2006, our publishers commissioned us to travel to the Middle East to research and write Saha, the first of our travel-cookbooks. This was the book I had always wanted to write! I was able to return to the land of my heritage, visit food producers, chefs and family there, and gain invaluable inspiration from the source. Thanks to the success of Saha, we were then commissioned to write another travel-cookbook. I had strong memories of Turkey from the time I lived in Austria as a young cook, and I had always wanted to return to explore the food in greater depth. In 2007, Lucy and I spent 5 weeks travelling around the country to research the food and cooking of Turkey for our book, Turquoise. Our fifth book (Saraban) explores the food of Persia, and will be released in November 2010. In this interview “Cooks and their Books” from February 2009 (SBS Food), Greg explains his journey with food. Listen here. What are the challenges in creating Middle Eastern or Eastern Mediterranean dishes in Australia? Some specialist or locally-grown ingredients are very hard to find, outside of the home country. For example, there is nothing like the range of wild greens in Australia, as there is in Turkey. It is hard for us to make dondurma (Turkish ice cream) here, because we can’t source mastic and sahlep easily here. Fruits, such as mulberries, tiny wild figs, barberries are virtually unknown here. Molasses - or pekmez - from pomegranates or grapes or mulberries are hard to find in Australia and there is nothing like the range and variety of Turkish dried peppers. We cant get sheep’s milk butter or such good yoghurt. Nor can we get kaymak, one of my very favourite items! How do you balance authenticity with practicality when it comes to application of ethnic cuisines outside of their home countries? Because of the challenges in finding the specialty ingredients, It can be quite difficult to make a dish in an entirely authentic way. It’s not impossible, and as a chef I am able to encourage growers to grow things for me (so I have producers growing purslane and fenugreek and savory and sourcing edible blossoms and flowers for me) and I try to find distributors who can import particular specialist ingredients for me. It can also be hard to learn specialist skilled techniques. But we are lucky to have a broad range of nationalities living in Australia, so there are people who bring skills (such as baking or sweet pastry and confectionary making) with them from their homeland. But this is not really something that limits my imagination when it comes to creating dishes and menus. To me, the purist approach, which says the only good food is food that follows tradition, is nonsense. Cooking is a skill or a craft that is ‘living’. It always reflects its times and the prevailing culture. When new ingredients become available, and migrants travel to new lands, they always take their food culture with them. Over time dishes influence and are influenced by the new country. 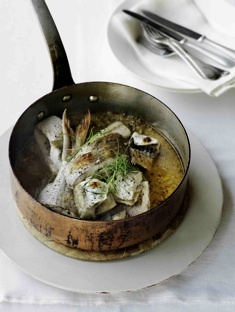 Australia is a great example of the way in which different cuisines are evolving. I do think it is important to understand tradition though and cooks do need to respect ingredients and traditions. I respect and love traditional dishes. Koussa mahshi (stuffed zucchini) is one of my favourite Lebanese home-cooked meals! You can’t just put ‘exotic’ ingredients together and hope for the best. My approach is always to try to research (by reading, but more importantly, by travel) first, and then to allow my imagination to take things to another level. What is the culinary focus/story of your restaurant MoMo? Since I had my first head-chef job and was able to run my own kitchen, my driving force has been to bring the flavours of the Middle East into the West. This was what I did at O’Connells restaurant, and I continue to do the same at MoMo. So here you eat contemporary Middle Eastern food. The dishes are my interpretations of food from various countries in the Middle East/Eastern Mediterranean, reaching into North Africa and Moorish Spain. I believe it is crucial to understand the soul of the dish before you start to interpret it, and that’s why I think travel is so important to explore the ingredients, techniques, terrain in the land of origin. I try to keep the tradition or the soul of a dish or technique, but present things in a slightly new way. A meal at MoMo is generous - again, because this element of generosity and hospitality is so crucial in Middle Eastern countries. It is all about sharing, so the meals are banquet style. We thank Greg for this interview, his insights and views on Turkish cuisine. We are looking forward to his new book soon to be released and the recipes he will be sharing with us here on Foods of Turkey. We also thank his publisher, Hardie Grant for allowing us to use the photographs provided here.